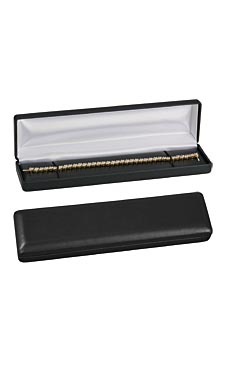 Show off your best jewelry and give your customers something to present their special purchases in with our Black Faux Leather Bracelet/Watch Box. The bracelet/watch box is an ideal choice for housing a special piece of jewelry. The box is a metal base covered in black faux leather. The back of the box is hinged. The inside has two black stretch bands on each end to secure the jewelry over a black leather cover. The inside rear of the box is wrapped in a white covering.